The oldest Longmorn single malts ever released, and for a very special reason. 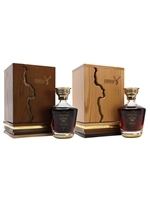 On 2 February 1961, these two whiskies were filled into twin first-fill sherry hogsheads by George Urquhart, who led the second generation of the Gordon & MacPhail bottling dynasty, and sat side-by-side in the warehouse for 57 years – when they were discovered by Stuart and Richard Urquhart, fifth generation family members who also happen to be twins. The pair were fascinated by the prospect of whisky that mirrored their own experience – sharing the same DNA, but shaped by different maturation – and bottled both hogsheads, one European Oak, one American Oak, in tribute to the beguiling nature of twins. These two whiskies, each of which would be worthy of attention in its own right, together create a fascinating showcase of not only the maturation potential of excellent whisky, but also the captivating qualities produced by different wood on identical spirit.